Due to demands of a new job, low traffic and declining motivation I have decided to pause this blog. It's been fun but the novelty has worn off. One must think only of one's work. When I began as an apprentice I was in the kitchen at five o'clock in the morning and I didn't stop until eleven at night, with just a couple hours rest in the afternoon. That was my schedule in 1914 at the Hotel Bristol in Paris. It has been my schedule ever since. It's too much, isn't it? But la grande cuisine is pitiless. Every year a bureaucrat in Brussels sets the price of sugar for European farmers — at four times the market price. No wonder they produce five million tonnes too much of it, preventing other sugar-growing countries from competing. Put this another way: for every £3 the EU gives to Mozambique in aid, it takes back £1 in the damage it does to its sugar industry. The women whom Mr Brown met do not want aid. They want their business to thrive. 1 - Marlon Brando almost turned down the Godfather because he did not want to glorify the Mafia. The guaglioni [footsoldiers] of the clan all dress the same: they wear Nikes, torn jeans and T-shirts resembling the tops of English football uniforms. In their world such details are much more important than we realise. They amount to a trademark to which one belongs, which sets them apart, but also makes them appear like many other kids in the outskirts of town. What we're seeing is an anthropological mutation which has transformed the Camorristi of Secondigliano into cinema gangsters. These are people in their thirties who use violence as a status symbol. It is probably cliched, but definitely accurate to say that if we don't learn the lessons of history, we are bound to repeat them. The interesting thing is that the timescale of democratic elections promotes a short-termism that inhibits this learning process. History has shown that political stability and institutions with certain characteristics are necessary for economic growth and health. Placating ill-informed leftist lobbyists, unfortunately, does very little to help the people in question. Good intentions are not enough - we need better institutions to channel the self-interest of those in power toward more useful ends. Or, and my preference given that such institutional arrangements are extremely rare, we need to decrease the amount of power available, and compartmentalise it. For me she is an extremely important intellectual figure, primarily for the role her novels played in spreading a popular appreciation of pure capitalism, mainly in America. I also admire her brazen philosophical approach but I am put off by the cultishness of Randians, who in inheriting her black/white world view, alienate themselves. The Randian black or white blinker prohibits true believers from partaking in "normal" complex, messy, everyday life - and perhaps the ultimate evidence of the problems Objectivism can cause as a guide to life is illustrated by Rand's tragic personal life. So Happy Birthday Ayn Rand and thank you. Defying the suicide bombers and head-hackers, courageous Iraqis went to the polls in huge numbers. Before the vote, the naysayers told us that the indelible purple dye on each voter's finger would mark them out for punishment by "insurgents". Instead, it became a defiant symbol of the country's freedom. I liked the picture of some grizzled beaming Arab so proud of his purple finger that he dipped a second one and then raised both to the camera - flipping the V sign, or so I like to think, to the BBC, to Sir Simon Jenkins, to Do-Nothing Doug Hurd, to those Spanish protesters and the rest of the quagmire fetishists. The most fascinating detail in the big picture was this: Iraqi expats weren't voting just in Sydney and London and Los Angeles, but also in Syria. Think about that. If you're an Iraqi in Syria, you can vote for the political party of your choice. If you're a Syrian in Syria, you have no choice at all. Which of those arrangements is the one with a future? I agree with the sentiment of the piece but I think we need to look on a much longer timescale. Those who so freely criticise the democratic process and liberation, whilst essentially correct, are obviously far too short-termist, and the absurdity of their position is clear with the help of even a little historical knowledge. Similarly, to suggest, within only a few days of the election that Iraq has turned the corner is risky. I tend to think that the Arab world might be shocked into reform and/or revolt, but we need to wait and see. Segment the oranges and grapefruit. Make a syrup from the zest and juice, with a little sugar. Boil some dried liquorice in sugar syrup for 5 minutes and leave to infuse. Blitz the liquorice with just enough of the syrup to make a thick paste. Mix this into the whipped cream. 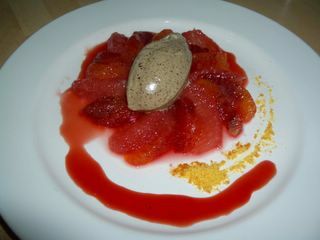 This is a refreshing dessert, ideal to follow a rich meal - the fruitiness of the liquorice worked very well with the salad. You could make a liquorice sauce for the salad but the cream mellows and improves the flavour of the liquorice. The beginning of the end for State education in the UK? The Sunday Telegraph (no link) reports that the University of Chicago is to open a department in London this summer to allow students to earn a Masters from the university's business school. In one sense it might be seen as just another MBA course. However, if it is the beginning of a trend for the internationalisation of education, it will hopefully shake-up the UK system. With UK universities caught between a fee cap and artificially rising student numbers, it would be no surprise to see students being drawn toward the higher quality education offered by US universities, and with their huge endowments, they would be able to offer bursaries far in excess of those available in the UK currently. Prof Oswald of Warwick University, a luke warm market advocate at the best of times welcomes the move: It is a very logical development which we will see a great deal of in the next decade. Just as computers and cars are exported, so will university education. According to an article in The Business, the Italian Mafia's turnover has doubled in the last 2 years, from E43bn in 2002 to an estimated E100bn last year. Once you see past the irresponsible glamorisation of the Mafia in much popular culture, you see what a burden it is on society. The Mafia is not a social service that operates for the benefit of all, but rather an exclusive association which acts against society as a whole for the sole benefit of its members. Evidence of this can be found in the Godfather films when no act of generosity by the Mafia is complete without the recipient being burdened with a "promise" to repay the favour. Modern States act in a similar way, with taxes being raised to provide services contingent on adhering to a legal framework. This is perhaps the key difference between the Mafia and the State, and a powerful argument against those who condone the Mafia on account of its ability to fill gaps left by the State. The advantage a State has is its relative stability, viz. the Mafia. You might not like the level of taxation, but you can be fairly sure how much you will be paying annually. This certainty is diluted under Mafia rule because individuals have far more discretionary power. So, I submit, capitalism - the consequence of freedom of contract and freedom to trade - is a triumphant force that ennobles its participants. I am making no new claim. Adam Smith taught us all we needed to know in his magisterial the Wealth of Nations. What this fascinating book allows us to see is just how subtle yet simple is the recipe for happiness. Domestic mercantilism is more dangerous than international terrorism. Given that 2005 is the centenary of Ayn Rand's birth, it seems appropriate to have some Randian influenced stuff. February 2 is the official day and it is obviously not a public holiday. Like it or not, and I tend toward the former, Rand has been and continues to be hugely influential, although most people seem to experience only transitory Randian periods in their intellectual development. The first is this picture of Prado Dam in the US which Rand no doubt would have appreciated as a representation of man's mastery over nature. pull a Hopkins intr. v.
1. to become faint or nauseated upon hearing a statement contrary to one's ideology or dogma. 2. to leave the room, usually dramatically, because of such faintness or nausea. 3. to feign such faintness or nausea as part of a ploy to establish or reinforce a social convention about the limits of acceptable discourse. e.g. : "I pulled a Hopkins when I heard Bob say that, even though it has never worked, communism is 'a good idea.'" "I just couldn't breathe because this kind of bias makes me physically ill. I would've either blacked out or thrown up." - Professor Nancy Hopkins, in response to Harvard President Larry Summer's conjecture that women are scarce in certain mathematical disciplines because of genetic differences between the sexes. Look, the truth cannot be offensive. Perhaps the hypothesis is wrong, but how would we ever find out whether it is wrong if it is “offensive” even to consider it? People who storm out of a meeting at the mention of a hypothesis, or declare it taboo or offensive without providing arguments or evidence, don’t get the concept of a university or free inquiry. • had over the preceding 40 years made distinguished contributions to economic theory (including marginal utility theory, marginal productivity theory, and the first supply and demand schedules ever drawn). That country is Germany. But despite the strength of its heritage in economics, from the time of the formation of German Empire in 1870, economics (as it is ordinarily understood) died. It was replaced by the German Historical School of Economics (GHS), led by Gustav von Schmoller, who could claim after a period of time that the appointment of any "Smithian" in the German University system was impossible. Repudiating all theory, the Historical School dedicated itself to eliminating "Smithianismus" and "Manchesterismus", and providing rationalisations for the cartelisation of industry and the establishment of protection. They were keen advocates of "social welfare" programmes to preserve cohesion of the new state. They also eagerly lent themselves to the collection of colonies in Africa and the Pacific, and the construction of a massive naval fleet. Giving something to everyone, German lecture theatres were flooded with students keen to absorb the economic wisdom of the Historical School of the day. The hostility of the Historical School to theory amounted to a program of intellectual disarmament. Did Germany suffer? Not immediately. Between 1871 and 1910 real GDP per head grew a more than respectable 73 percent. (Protectionists should note that Germany did not grow as much as Sweden. With a distinctly less protectionist policy, Sweden experienced a real GDP growth per head of 117 percent over the same period.) But economics – like medicine or dentistry – proves its value best, not in the easy times, but the difficult ones. The GHS amounted to a piece of intellectual disarmament, and this had two catastrophic consequences after 1914. The German hyperinflation of 1922-23 is directly attributable to the precepts of Historical School that had "proved" the falsehood of what we call "monetarism". The ineffectiveness of German economists in dealing with the Great Depression is also attributable in part to the intellectual impoverishment of the Historical School. The most effective responses to the Depression, recall, came from the centre of mainstream economics, in Cambridge. Germany paid for its anti-economics in material terms. And perhaps it paid in other terms. For the costs of damaging the credit of economics will never be purely material. Economics is built on premises that have a far wider remit than the simply material. These premises include; the oneness of human kind; the value of rationality, utility, freedom; the strong likelihood that each person is the best judge of their interest. Damage these premises, throw them away, or cover them with doubt and derision, and it is not just a lower GDP that is in prospect. Anti-economics may yet be as dangerous as the guillotine. 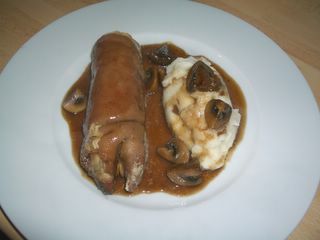 boned, braised trotters stuffed with chicken mousse and poached, pommes puree, and a veal jus with mushrooms. In his unique style, Marco Pierre White said the following about this dish: This is my favourite dish. If it had been a painting it would hang in the Tate. It's simple and earthy, but it's also elegant and intelligent. You can't take it any further. It's a complete meal. It's not a recipe for talking about; it's a meal to be eaten. I was a little underwhelmed by the dish, to be honest. It is probably the richest dish I have eaten, and you can feel and taste the gelatine coating your mouth, but the flavour is a little too subtle for me. That said, it is a classic dish and well worth preparing at least once. This story in The Times illustrates the pitfalls of affirmative action. Mr Dube, who has no birth certificate but thinks that he is 42, is a blatant example of a new South African business practice called “fronting”. This involves white-owned companies promoting one of their former black employees, often from a lowly position, to director level. Then the person fronts the company, enabling it to portray itself as a black firm and receive favourable treatment when government tenders are handed out. Under controversial Black Economic Empowerment (BEE) legislation, adopted in 2003 to try to speed up the slow pace of change in South Africa, companies who employ people termed the “previously disadvantaged” can expect favourable treatment. Another recent case of fronting involved a white businesswoman’s maid and her daughter who were made co-directors of her construction company. Thomas Sowell's Affirmative Action is an excellent analysis of the failings of affirmative action. The 2005 Michelin Guide is out. Details from the Evening Standard and Squaremeal. The Telegraph has a surreal story about an 84 year old pupil in Kenya who is facing expulsion. He was popular with pupils and teachers and was made a prefect. But when he began his second year this month, some parents protested. Mr Maruge was a "smart Alec" prone to histrionics, one said. "Our children don't concentrate," the parent said. "They are too busy wondering what he is going to do next. He tries to dominate the class." Mrs Obinchu says the accusations are "poppycock" but parents counter that Mr. Maruge - who was top of his class last year - has become a teacher's pet and have questioned his grades. A parents' delegation went to the mayor's office yesterday demanding his expulsion and the removal of the headmistress. "If I am expelled I will surely die," said Mr Maruge.